We had to share this project because we enjoyed working with this family and love how we changed this space! This was a fun design project for a little girl. 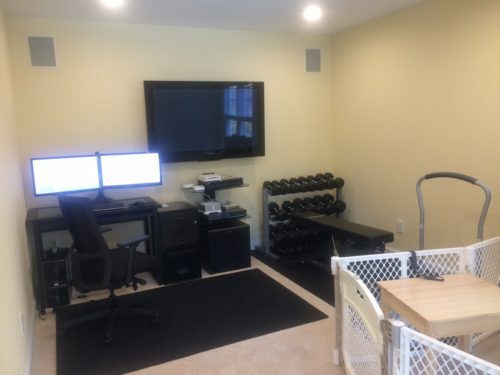 Her parents reached out to us to help them convert a gym/office into a bedroom/playroom for their daughter, incorporating existing furniture pieces. 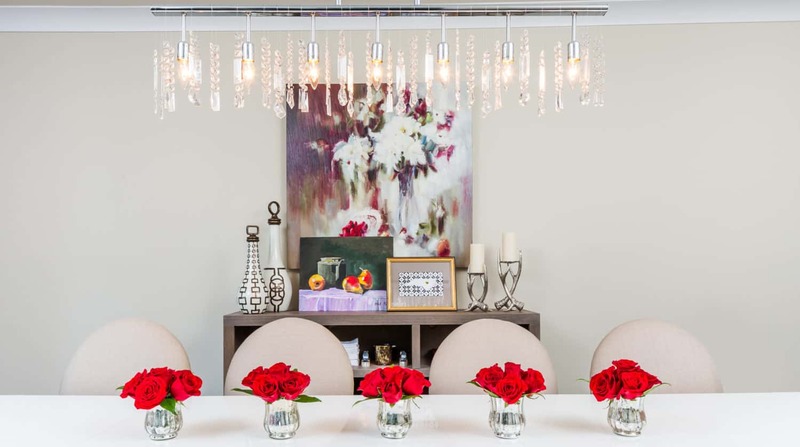 This had to be a beautiful transformation of the space! Relocating the office/gym to another space allowed us to create room for dresser, “grow with me” crib/bed. Crown molding was added to give the room a finished look. Before the nook has a built in bench with hard to reach storage space. It was removed to create more floor space for the plush round rug and a ceiling canopy. We started with a color inspiration – the little girl wanted a blue room. 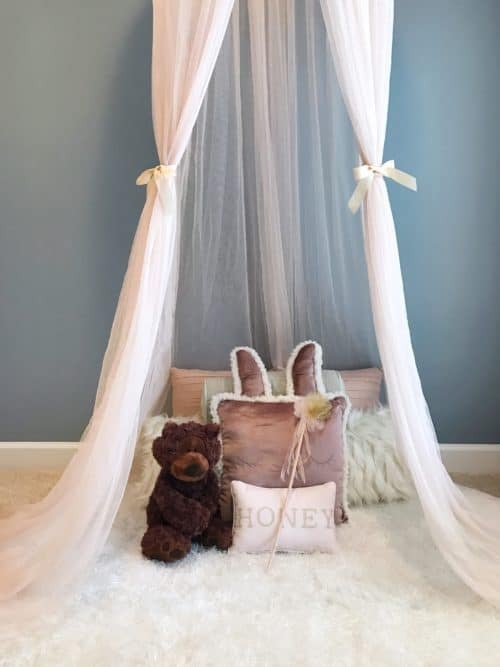 While looking for the perfect blue, we wanted to find one that would work well with the pale pink in the bedding and blackout draperies, and also a color that would not be too “baby” blue. We wanted to make sure that the room could easily “grow” with the child. 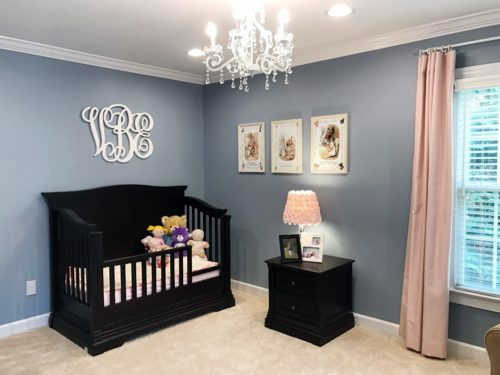 We kept patterns to a minimum, introduced a theme through framed Peter Rabbit posters (easily replaced as the child’s preferences change), added a classic touch with a monogram, and introduced a little bit of glam with a crystal chandelier. Adding the crown molding was relatively inexpensive way to elevate the space to a more upscale look. 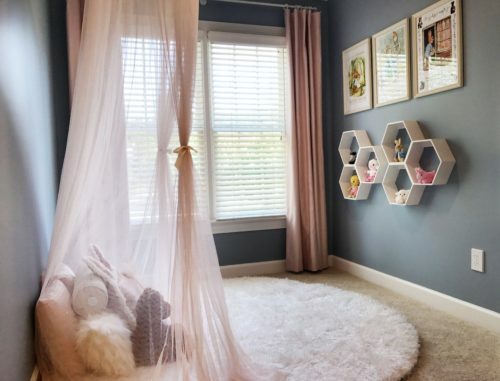 See how the space turned from blank canvas into a beautiful room for the little lady to enjoy! Simple and elegant girl’s bedroom featuring blue and pinks. Peter Rabbit posters introduce a theme, while honeycomb shaped shelves create a perfect spot to gather all little friends. This will be a cozy spot to play, dream, read, chat, and snuggle with mom or girlfriends. Elevation, wall by wall, showing the furniture layout as well the wall decor and window treatments. Nook wall elevation showing window bench removed and new built-in book shelf added. What do you think? 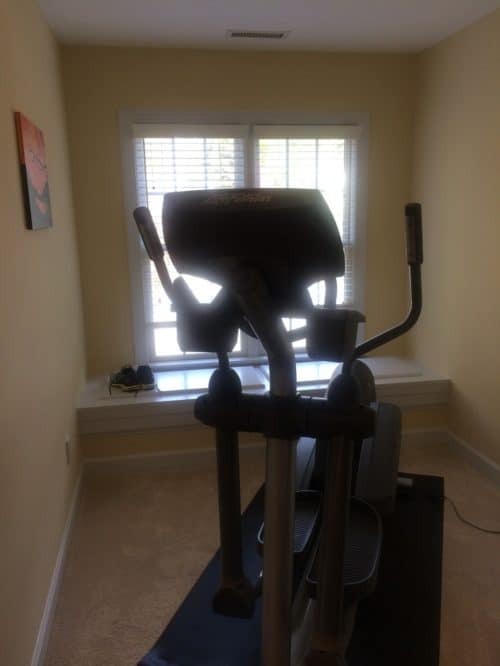 Do you have a room in need of transformation like this one? Click here to get in touch with us – we would love to work with you! Looks very relaxing, calm and cute. Love that idea. Thanks! the job you did with transforming the room into a such a beautiful place is outstanding! Such a lovely place for a little girl! Natalya, thank you so much so the kind words! you have an amazing taste of color choice I love the arrangements and the colors are looking very great. Thanks for sharing the post.